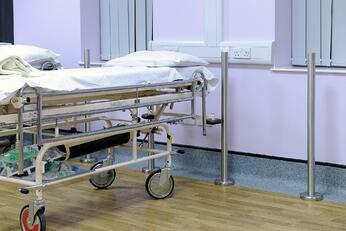 When planning an installation at a healthcare facility, patient safety is of utmost importance. That’s why patient rooms require so much care in planning, and why architects and interior designers working on hospitals often come to us seeking flooring accessories that will create the most sanitary, safe environment possible. 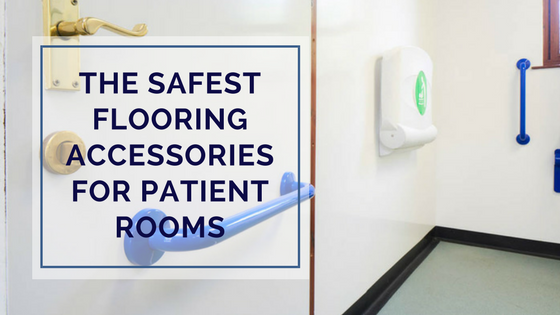 Here are some of the best flooring accessories for patient rooms that can help promote safety for patients, their families, and the doctors and nurses taking care of them. One of the biggest issues in patient rooms is slipping and falling. Patients may slip when stepping out of bed, or could fall if their IV pole gets caught on a wire or bulky transition on the floor. These scenarios can seriously impact a patient’s recovery, so it’s important to avoid them. The flooring accessories you’ll most often see in patient rooms are t-caps or transition strips (from the hallway to the room, the room to the bathroom, or the shower to the rest of the bathroom) and cove base. 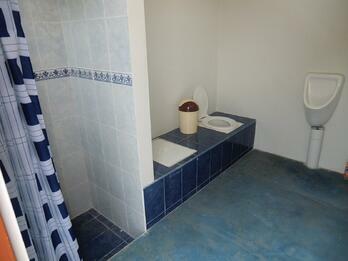 In a patient’s room, usefulness is the most important factor - design is secondary. Look for low-profile flooring accessories that won’t stand out so they don’t create trip hazards. For transitions, t-caps are often the option that will sit closest to the floor. These are ideal in rooms where the two flooring surfaces are of similar thickness. We most often recommend solid aluminum t-caps for hospitals. They are quite sturdy and can hold up through years of heavy traffic, and are often less expensive than transition strips. Unless you’re transitioning between two flooring surfaces of significantly different thicknesses, t-caps can be the perfect option. Not all patient rooms will require t-caps or transition strips. Many architects and interior designers choose to have one type of flooring throughout the patient care area, often vinyl, linoleum, or even a coated concrete. If you go this route, we recommend signaling the change from hallway to patient room with a change in color, for example a grey vinyl in the hallway and a cream vinyl in the patient room. Patient rooms often feature standard, simple PVC cove base because it is inexpensive and very durable. PVC can stand up to wheelchairs and gurneys that may roll into them, as well as the constant cleaning and buffing required to keep the space sanitary. One common problem with PVC cove base profiles is that they can fade over time, but this is often not a serious concern in hospitals because the cost to replace them is relatively insignificant. When it comes to cove base, proper installation is one of the most important features since the cove base must be completely sealed. It is essential that nothing can get between the empty space and the wall, like bacteria or fluids, so ensure you work with a reputable flooring contractor who can install it properly. A serious hazard can arise when water from the patient’s shower splashes out onto the floor, leading to potential slips and falls. At home this isn’t a problem since most people have deep tubs or raised edges around their showers, trapping the water in. Hospital showers, on the other hand, need to be very low to the ground to accommodate canes, walkers, or patients who are unable to lift their legs very high, so there’s nothing to prevent water from splashing out. Many hospitals have flat metal transitions between the patient’s shower and the rest of the bathroom, but these are not effective and water will splash everywhere. A much better solution is a wetroom transition strip. 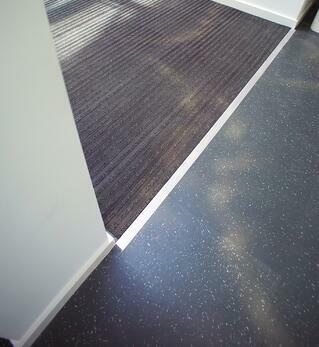 Gradus has a line of wet transition strips made of PVC that help keep water in the shower instead of out onto the floor. While these don’t create a completely flat transition, they do make one that is very level and easy to roll over. While many hospitals don’t have them, wetroom transition strips are an essential safety feature in patient rooms, helping to prevent very serious slips and falls. Patient rooms need to be comfortable, accessible, and, most of all, safe, and specifying durable, secure flooring accessories can play a major role in achieving these goals. If you have any additional questions about flooring accessories for patient rooms, please don’t hesitate to contact us.